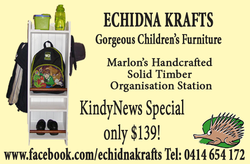 _KindyNews is your LOCAL print and Emag packed with quality news, tips, and advice for mums 'n dads of KindyNews-aged kids in YOUR area. Here's a list of our favourite local playgroups. Pick your suburb and click through for details. You are welcome to join the KindyNews Directory absolutely Free! Just Click on the Join Now Button on the right panel. Be on KindyNews Directory: It's FREE! Join the KindyNews Directory FREE!